It is mid-morning, and the quayside in Looe, a picturesque port on the south coast of Cornwall, is crammed with trawlers and small fishing boats. A weekend of storms has kept the boats inshore, and today a spring tide prevents David Bond from venturing out to sea. From the deck of the Mystique, a 33-foot netter and handliner, he reflects on one of the darker periods of fishing history. "In the 1970s, it used to be like a city out there at night. It was a sea of lights, with the Scottish boats chasing the mackerel shoals." Unfortunately, the Scottish purse-seiners chased the mackerel so ruthlessly that stocks plummeted, and traditional fishermen like Bond, who catch mackerel on handlines trailed from small boats, found their livelihoods under threat. Before the Scots arrived, around 200 handline boats were benefiting from a sudden explosion of the over-wintering mackerel population off the south-west coast. At its peak in the 1970s, the handline fishery landed 20,000 tonnes in a single year. Today, the handliners' share of the catch is less than a tenth of that, and the number of boats has fallen to around 60. Yet Bond and his fellow mackerelmen are optimistic about the future of their low-tech industry. Their optimism stems, in part, from a belief that consumers - and retailers - will increasingly demand that their fish comes from sustainably managed fisheries. That the handliners have survived at all is largely thanks to the existence of the South West Mackerel Box, created in 1981 to protect juvenile mackerel from purse-seining and trawling, and extended in 1989. Within this great chunk of sea, the handliners are the only fishermen allowed to target mackerel. Since 1998, the handline fishery has received an annual allocation of 0.83% of the UK mackerel quota, or 1750 tonnes, whichever is the greater. In 2001 the handline fishery was certified as one of the UK's few sustainable fisheries by the Marine Stewardship Council (MSC), and Cornish mackerel with the MSC logo are now on sale in supermarkets and other outlets. "We're hoping the logo will distinguish our fish from other mackerel," says Bond. "If customers begin to demand our fish, and sales go up, then supermarkets will have to compete to buy it. If that happens, we should get more for our fish." According to the UN Food and Agriculture Organisation, half of the world's major fish stocks are now fully exploited, 15% are over-fished and 7% are depleted. The picture is especially bleak around the UK. North Sea cod is an endangered species, haddock are in trouble, many herring stocks are dangerously low, mackerel are much depleted, and some once plentiful fish like skate are close to extinction. Concern about the dire state of our fisheries led to the foundation in 1997 of the Marine Stewardship Council, the progeny of two seemingly strange bedfellows, the Worldwide Fund for Nature (WWF), one of the largest conservation organisations, and Unilever, a company with major seafood interests. "Our aim is quite simple," says Hilary Khawan, MSC's commercial director. "It is to promote sustainable fisheries through certification and eco-labelling." MSC has come up with a set of principles and criteria for sustainable fishing. The fishery must not lead to over-fishing; it must not damage the habitat on which the fishery depends, or harm ecologically related species; and it must be subject to an effective management system that respects existing laws. Fisheries that wish to apply are assessed by independent certifiers. With the help of local experts, scientists and others, the certifiers examine the entire 'chain of custody', from fishing boat to shop shelf. Fisheries certification is still in its infancy and it remains to be seen whether it will bring higher prices, as the Cornish mackerelmen hope. With a fish as volatile in price as mackerel - in times of plenty last year it fetched a mere12p/kilo at Looe auctions; in times of scarcity, £1/kilo - it is hard to discern price trends. "So far, I'd say certification has made no difference price-wise," says David Bond. However, Looe fish auctioneer Hugh Symons is not so sure. "The price might be up a bit," he reflects in his office overlooking the harbour. What no-one in Looe disputes is that certification, in the long run, will prove beneficial, both for fish and fishermen. "I think the MSC logo is excellent," says Symons. "For one thing, it identifies a type of fishing that's sustainable. For another, the customer knows it's of the highest quality." Mackerel which are hoiked straight out of the water by handliners - or, for that matter, by purse-seiners - are much firmer and fresher than ones which have been dragged through the water by trawlers. According to Steve Farrar, manager of Bluesail Fish Company, a Looe-based buyer, MSC certification is signalling to consumers that someone, somewhere, is doing something about fisheries management. "It flags up sustainable fishing," he says. Just as significantly, he believe that certification ensures that there will be no slackening of controls in the South West Mackerel Box. 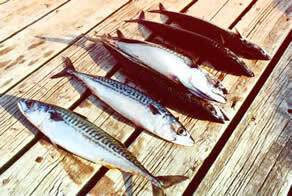 The mackerel box has undoubtedly helped to protect mackerel from further plunder, but it is not to everyone's liking. A Plymouth-based company with a fleet of trawlers has continually agitated for access to the mackerel box, arguing that its boats would fish in a sustainable manner. But the handliners maintain that the industrial fleets that legally prosecute scad and pilchard within the mackerel box are already doing serious damage to the mackerel. "I'd say that more mackerel are dumped overboard, dead, by industrial fisheries than are caught by our boats," says David Muirhead of the South West Handline Fishermen's Association. Allowing trawlers from Plymouth or elsewhere to target adult mackerel would simply make matters worse. "I'm convinced that MSC-certification reinforces protection of the mackerel box," says Steve Farrar, "and that's good not just for the mackerel but all the other fish that feed on them." By mid-2002, six fisheries had been awarded the MSC logo. Some, like the Thames herring industry, supply small, regional markets, but there are high-volume certified fisheries too. MSC's Hillary Khawan hopes that New Zealand hoki will provide an alternative to cod, which it closely resembles. "If we are to take pressure off North Sea cod stocks," she says, "then consumers will have to opt for species like hoki which are abundant and well managed." Khawan says that Sainsbury's response has been particularly encouraging. Britain's largest fishmonger provides core-funding for MSC and is about to support the tuna fisheries officer who will help to develop standards of best practice for tuna fisheries. Sainsbury's also stocks MSC-certified fish. According to George White, in Sainsbury's environment department, the retailer was immediately attracted to MSC fish as it had had good experience with the Forest Stewardship Council (FSC) certification scheme for forests and woodlands. Some 6,000 FSC-certified products are now on sale in the UK, with a retail value of over £500 million a year. "We liked the idea of credible standards and independent certification," says White. "MSC involves some of the same players as FSC, so we decided to leap in." Sainsbury's MSC-certified fish sales now exceed £4 million a year, or around 2 per cent of total fish sales. White believes the proportion of certified fish will increase in future, but at present retailers are reluctant to promote MSC fish as supplies are limited. "If we promote the fish before we have serious volumes," says White, "then we run the risk of raising expectations and not being able to meet them. But if we don't promote, then there won't be the demand we need." At present, consumer awareness about the MSC logo remains relatively low. If it is to grow appreciably, the availability of MSC fish must increase, with certified lines becoming available throughout the year. Soon they may be: over 20 fisheries are in the process of being certified, and in a few years' time the MSC logo may be as readily understood for fish as the Soil Association symbol is for organic food. This will be good news not just for the fish, but for the fishermen too. White believes that once retailers compete for certified fish, the price the fishermen receive might rise.